Sago Pondweed has round leaves that come to a point like a needle. They are arranged in sheaths on the main stem. 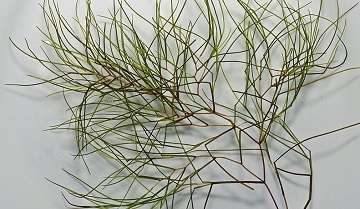 Sago Pondweed is a very common species of submersed plant that is found in both lakes and ponds. When viewed from the surface of the water, it can resemble long strands of grass growing up from the bottom. The leaves are very thin and about the same size of a needle. The leaves grow in thick layers and originate from a sheath. The plant’s flowers and fruit are produced on a slender stalk that may be submersed or floating on the water surface. This plant can be found worldwide in fresh, brackish, and saline waters. Dibrox®, Cutrine Plus, and Aquathol K can be used to treat Sago Pondweed. You can order these products on this website.